Septoria leaf spot is caused by the fungus Septoria lycopersici Speg. 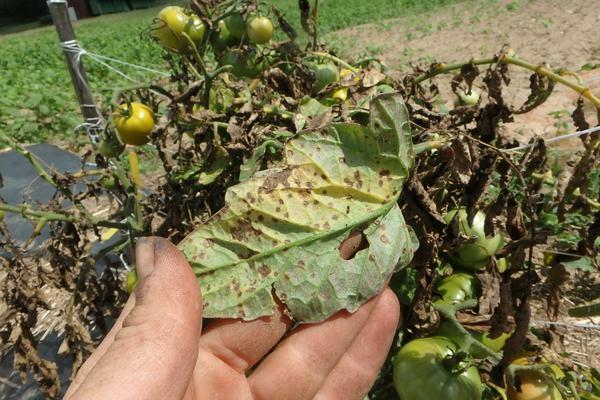 The disease is particularly destructive in seasons of moderate temperature and abundant rainfall, with the ability to reduce tomato yields dramatically. Septoria leaf spot on tomato. Septoria spore production on underside of tomato leaf. This disease primarily affects tomato, although some solanaceous weeds like horsenettle (Solanum carolinense L.) are known to be hosts. Symptoms generally develop on the lower leaves first, although the stems, petioles, and calyx also can become infected. Circular, tan to gray, lesions develop on the leaves and stems of the plant. The lesions generally have a dark-brown perimeter and a yellow halo may develop around the leaf lesions. 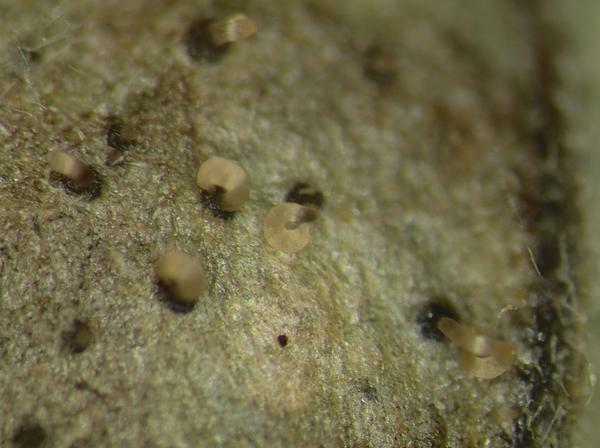 Small dark spots may appear in the center of the lesion – these are pycnidia, the fruiting body of the fungus where spores are produced. On the underside of the leaves, spots may appear as a darker green color or “water-soaked.” As the disease progresses, traveling from older growth to younger growth, spots may coalesce and the leaves may become entirely brown and wither. The fruit is rarely infected by this fungus. Areas with high humidity and warm temperatures are most susceptible to this disease. The fungus is known to overwinter on infected tomato debris and solanaceous weed hosts (such as horsenettle). Once an area has become infected, spores are generally spread by rain splash. Water is needed to spread the spores and even workers, equipment, or insects travelling through wet foliage infected with Septoria leaf spot can aid in the spreading of the disease. In addition to the cultural practices listed above, there are several products that are effective at controlling the disease. For the latest fungicide recommendations for Septoria leaf spot, consult the Southeastern US Vegetable Crop Handbook. 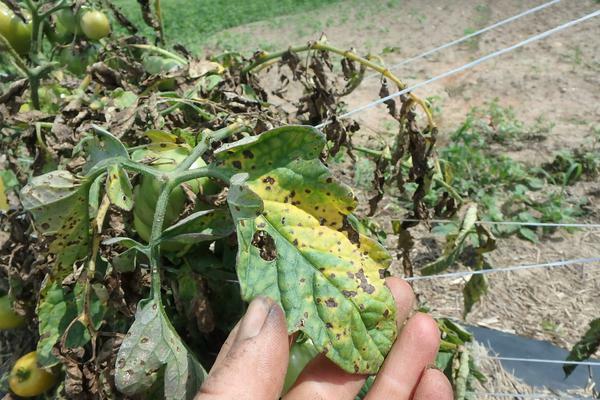 Example products for control of Septoria leaf spot in tomato. Organic growers should implement the cultural management practices outlined above. Some formulations of copper are certified for organic use and may provide adequate control. Be sure to follow directions on the product label. Home gardeners should first implement the cultural management practices outlined above.